When I was growing up, my family had a wonderful Black Lab, who touched all our lives in so many ways. Blacky lived to be nearly 15 years old, and when he finally passed on, it was like we all lost a piece of our heart. 1) Get to know your breed before you choose a puppy. Some dogs are more energetic than others, and it’s not necessarily anything to do with their size; a small Havanese (a very high-energy dog) might require more exercise than a huge Mastiff (which is just a big couch potato). Websites like Dogs 101 from Animal Planet make for a great place to start, and if you want to learn about the relationship between humans and dogs, I highly recommend “And Man Created Dog” by National Geographic. 2) Check your condo’s policies on dog ownership. Some condos restrict the size of dogs to nothing larger than 30 pounds, while others ban dog ownership entirely. It’s critical that you find out the policies before you bring a dog into your building, because disputes between condo boards and dog owners can get highly acrimonious very quickly; you don’t want a silly policy to threaten to separate you from your loving companion. 3) When housetraining, keep a set of clothes near your bed so you can take your dog out quickly. Sometimes a few seconds can be the difference between a successful bathroom trip outside, and an accident on the carpet. Having my clothes nearby meant that I could get up and out of the unit quickly, which made a big difference in how fast BonBon could get to the grass. More successful bathroom trips outside lead to greater confidence in a puppy’s bathroom skills, which in turn, lead to fewer stains on the carpet. It’s not like you can just open the back door and send the dog into the yard; in a condo, every puppy bathroom break involves getting fully dressed and ready for the outdoors. 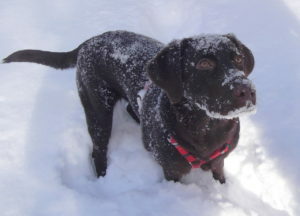 Admittedly, taking the puppy out in nice weather is a lot easier, and winter presents its own unique challenges; if my neighbours knew how many times I took BonBon outside in the middle of the night, wearing nothing but snowpants and my winter coat… Well, I’d probably be a lot more popular around the condo! 4) Don’t be afraid to do crate-training, but be sure to do it properly. Crate-training a dog can alleviate a lot of potential problems, and a properly crate-trained dog will feel happy and secure in its crate. They will think of it as a safe space that it has some ownership of, almost like it’s their own room, or den. They will avoid making a mess inside their crate and it can be very helpful in housebreaking your puppy. However, it’s crucial to use the crate for the proper purposes. NEVER place a dog in its crate as a means of disciplining the dog for bad behaviour, because it will quickly begin to associate the crate with punishment, and will become anxious and fearful of being placed in the crate. Make sure the dog’s crate is a happy place, filled with treats and toys, that the dog enjoys being in; one tip is to put your dog’s food and water bowls in the crate, to make it that much more appealing. 5) Locate nearby parks with off-leash areas, and socialize your dog frequently. You’d be surprised how many parks in Toronto have off-leash areas, and they’re becoming popular in other areas as well. These are great places for your puppy to learn how to interact with other dogs. One of the biggest problems for a dog living in a condo is the lack of time spent with other dogs; check out the City of Toronto’s website for a list of off-leash areas near you. Just make sure your puppy has all her shots before you expose her to dog parks! 6) If you’re buying a new condo, remember that lower is better! There’s nothing worse than waiting for the elevator on the 20th floor, as your dog desperately tries to avoid an accident… If you live on a lower floor, get used to taking the stairs instead. We’re on a lower floor in our building so it’s quite easy to take BonBon out when she needs to go, and we don’t have to wait for the elevator to reach us – we just trot down the stairs and let her do her business outside.